The grit of Tour de France competitors is legendary. There was Tyler Hamilton riding with a cracked collar bone back in 2003. This year, we have Dutch racer Johnny Hoogerland fighting on with 33 stitches in his leg after being knocked off the road by a TV car and cartwheeling into a barbed wire fence.¹ And he’s still in the best climber’s polka dot jersey. On the surface, you might think Le Tour de Milk Crate racers are not so tough. Come now! Look at this competitor. Hobbled by a leg injury, Johnny Crutchfield was not about to abandon Le Tour. 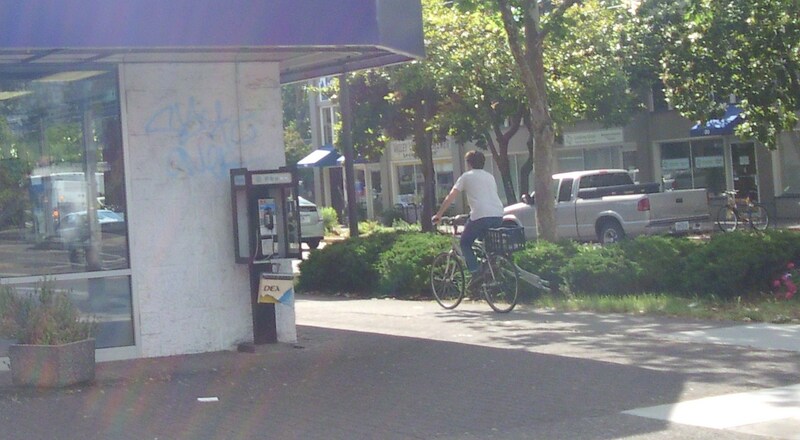 Lashing his crutches onto his bike, he cut from southbound Willamette Street onto the north sidewalk of 13th Avenue. He then road on and off and on and off the sidewalk along the north edge of 13th — the side of the street that doesn’t actually have the bike lane. He ran a red light or two. It was a strong move as he tried to capture the “I-need-all-the-help-I-can-get-to-avoid-being-hit-by-a-car” reflective safety vest, though he came just short today. We will say it was difficult to keep up with him while marginally obeying the laws of traffic. When we finally did catch him, he had locked his bike and was on his way to Full City for a coffee.